Sometimes the most simple of stories can portray the most depth and My Dog Socks is a testament to this. The interplay of story, illustrations and concepts all have layers that give depth of meaning to this beautiful story of a boy and his dog – some obvious, others quite subtle. Firstly, the story, written from the boy’s perspective, is penned in poetic prose, which flow seamlessly from one page to the next in an enticingly fun and totally intriguing style. The emotions attached to strong relationships are explored, showing the unconditional love and acceptance of the many sides of all living beings – the ups and downs of life and being there to support each other through the good and not so good times and also the acceptance of differences that comes with such a strong bond. The abstract elements of the watercolour illustrations cleverly convey the author’s words and add depth by the use of an extremely clever shadowing technique that depicts each stage of the story. 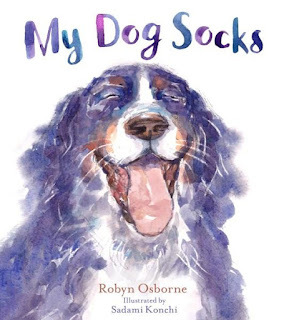 The dog is painted in a deep navy blue-purplish colour to make it stand out from the natural settings – I learnt this from the illustrator herself. It adds to the layers I mentioned at the start – stunningly so! This book is not only for lovers of ‘man’s best friend,’ but for those of us that love all animals - and you just might be surprised at how many other animals you can actually find throughout this book!